Ten romances that cover a variety of genres. It was supposed to be one night of passion – that turned into a crazy, unforgettable month. Until Serena McGregor finally walked away from undercover FBI agent Nick DeMarco. Six months later, her elusive scent still haunting him, Nick is ready to risk his career to prove Serena is innocent of a five million dollar heist. As an archivist, Serena likes tidy things, filed away in an orderly fashion. Too bad the only category Nick falls under is a heartache waiting to happen. He’s too much. Too passionate, too beautiful, and he definitely won’t stick around after he discovers all her secrets. But as a suspect in the robbery of the century, Serena can’t refuse his help. That’s not all she can’t refuse. Will this mismatched couple discover they have more in common than they imagine? Chance Spencer, doesn’t steal. Not anymore. Suddenly suspected of stealing half a million dollars of original paintings, Chance can’t afford to have the FBI delve too closely into his covert past. When one agent in particular endeavors to put him behind bars, Chance coerces the real thief’s daughter, Sarah O’Sullivan, into helping him flush her wily father out of hiding. Both want him found. Sarah, to warn her father of Chance’s intent to turn him over to the FBI. Chance, to hopefully catch the thief red-handed. To succeed in capturing the thief Chance must keep Sarah close to him. But his plan quickly deteriorates when the stakes for his freedom soar. How can he ruthlessly use the woman with whom he’s falling in love? Cold, hard facts make a case, but there’s nothing cold or hard about FBI Agent Vince Gage’s prime suspect, Sophie Pascotto. Despite incriminating evidence, Gage can’t convince himself Sophie is guilty. He struggles to balance the facts, but there’s one fact he can’t ignore–he’s falling in love with Sophie. Someone has set up Sophie and her brother to take the fall for art forgery and drug smuggling. When Gage discovers Sophie has received death threats, he convinces her they need to work together. Sophie soon realizes beneath his tough cop exterior lurks a kind man. This Gage is much more dangerous because he engages her heart. With her family under suspicion for forgery, the last person she should become involved with is a by-the-book FBI agent. Rafe Pascotto reluctantly agrees to help his brother-in-law, FBI Special Agent Vince Gage, by keeping tabs on a suspected international jewel thief. Reluctant, that is, until he meets beautiful Bridget O’Neill. Within minutes, Bridget recognizes Rafe for the rube he is, hooks him and publically hangs him out to dry. Unbelievable the man has come back for more because he thinks she needs protection. She’d enjoy the joke if she wasn’t so busy running from a past that’s about to catch up to her. His confidence shattered for failing to save his sister’s life, Detective Jay Rawlings insists he be left alone to live the lonesome cowboy life. But when the woman he once loved, Tess MacLean, returns to his ranch with a killer and the police in hot pursuit, Jay suddenly has to face the demons from his past. A past he would change if he could – starting with convincing Tess that their love deserves a second chance. Sylvie Carson has no idea what she’s going to do with the rest of her life! Artistically blocked, she hopes a prolonged stay in the seaside village she grew up in will help her get over this hump. But when Adam Hunter moves in next door, things only get more complicated, not less. The artist in Sylvie is immediately intrigued by her new neighbor—the haunting lines of his face, the natural athleticism of his body. Maybe Adam is the muse she’s been looking for…but his shadowed eyes suggest he’s just one more person keeping secrets from her. Though Sylvie can’t deny that Adam inspires passion in her, the last thing she needs is a romance…right? 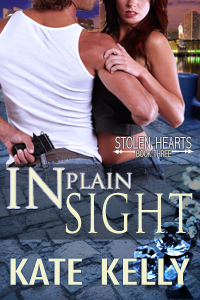 Falling for a woman with kids was never part of Jordan Tanner’s plans. His intention was to quickly sell the building he’s inherited and pave the way to financial freedom. Yet the moment he encounters Nell Hart—and her niece and nephew—all his goals fly out the window. Something about her zest and her passion leave him a little breathless. More than that, Jordan discovers he simply cannot put two traumatized kids out on the street. So what’s he to do? He still wants success and he’s not keen on being a landlord. But he also likes the feeling he gets when he’s with Nell and the kids. In the end, maybe there isn’t a choice after all. An absolute pleasure to read.